Springtime in Paris: Rise and Shine! 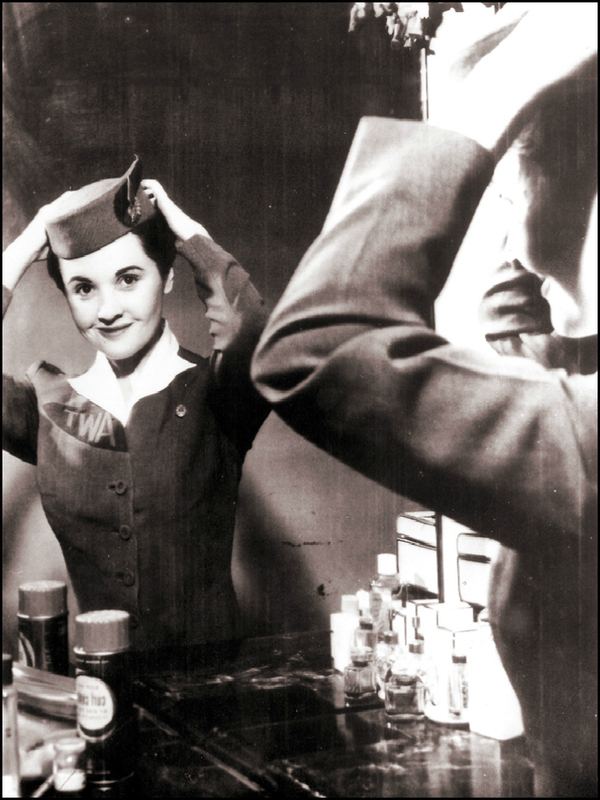 Calling all Guys and Dolls: Get ready to step out, and I don’t mean maybe. Start packing! Springtime has arrived, making it easy, breezy to tour, explore, and adore. This season we’ll not only brave New York’s concrete canyons to take a bite out of the Big Apple’s vitrines, but we’ll also waltz back in time to the Eternal City of Rome with one of my favorite photographers. And that’s not all. In the weeks ahead we’ve also lined up a rendezvous at a centuries-old Parisian fashion house. So there’s no need to pack your ball gown yet. I’ve got you covered, Cendrillon! O, sigh do sew! Pinch yourself. That’s how we roll. Today, though, let’s rise to the occasion at Le Grenier à Pain in Montmartre. Hook, line, and teeth sinker! Here is where I buy most of my baguettes and jambon-fromage sandwiches. Consistency, attentive service, and a wild house selection of cakes, breads, and tarts are just a few of the Grenier boulangerie’s captivating qualities. Add award-winning to the mix, too. 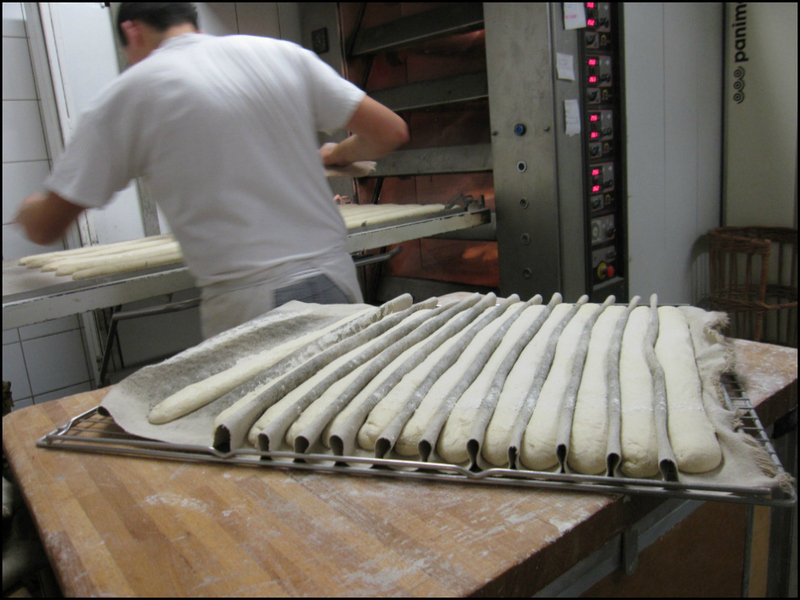 Back in 2010, Boulanger Djibril Bodian won the 2010 “Grand Prix de la Baguette de Tradition Française de la Ville de Paris” which not only earned him a medal and cash but also earned him the honor of baking bread for the Palais de l’Elysées for one year! America’s own White House pales in comparison! It’s all in the slashing! The annual award is based on aroma, honeycomb-like interior, and crust (which can never be too thin or too crisp). 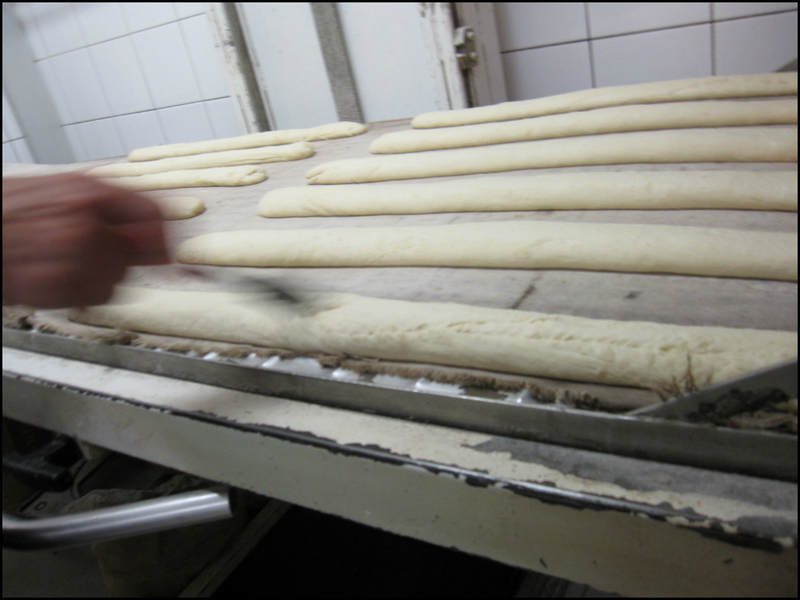 What makes Bodian’s bread so special? No shortcuts, long fermentation, and a dash of hazelnut. 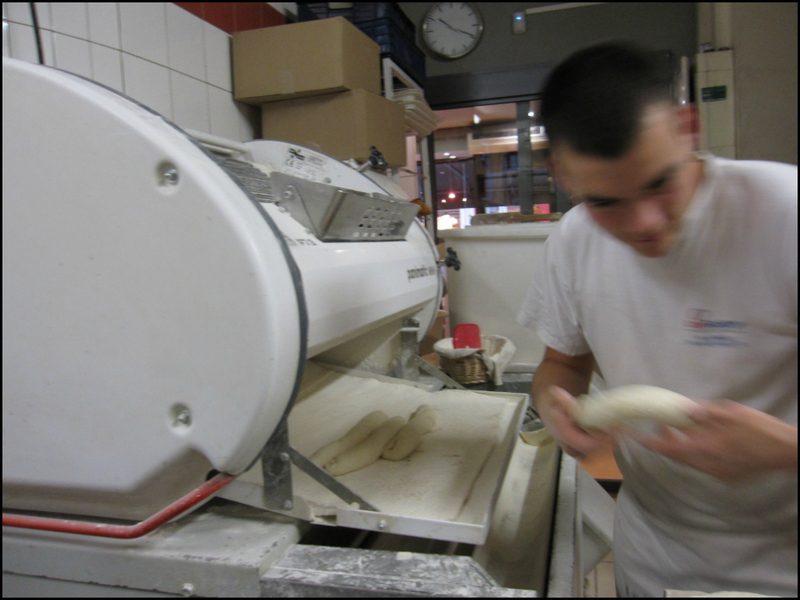 As a self-acclaimed bread fanatic, I wanted to learn more about the process. 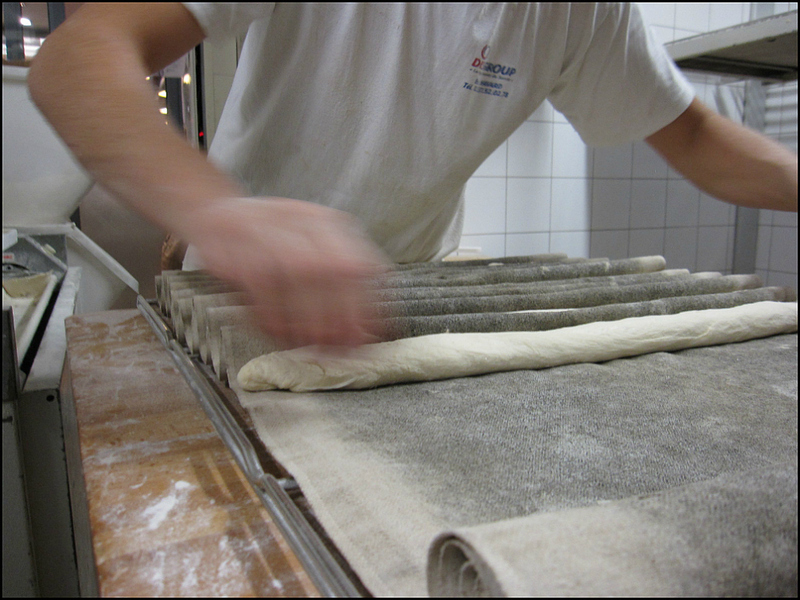 So I arranged to pop by Le Grenier à Pain for a lesson, hoping to learn all about the fine art of making a baguette. Full steam ahead: It was a baking affair to remember. 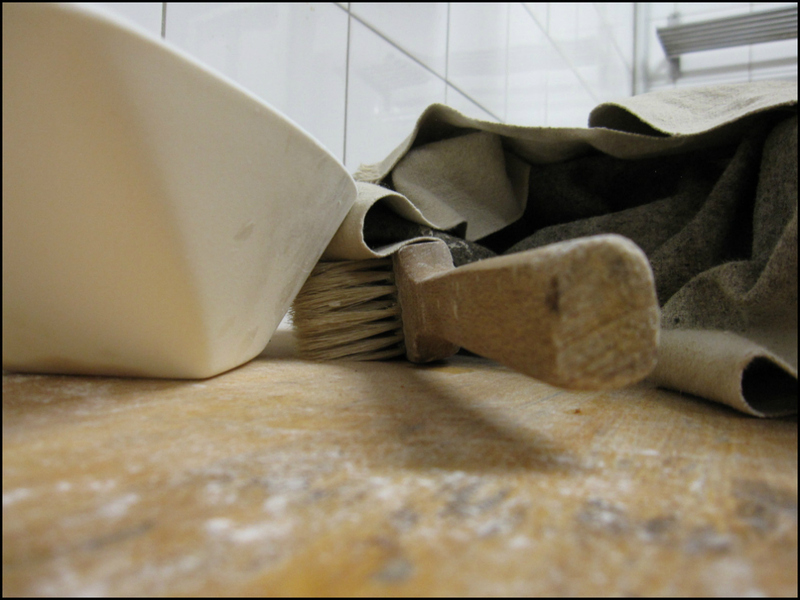 With the grace and focus of a gravity-defying Cirque du Soleil performer, my instructor skillfully juggled the fast moving balls of dough, the flour, and a wooden paddle. He was equal parts dancer, conductor, and piano player. Speed thrills, indeed. 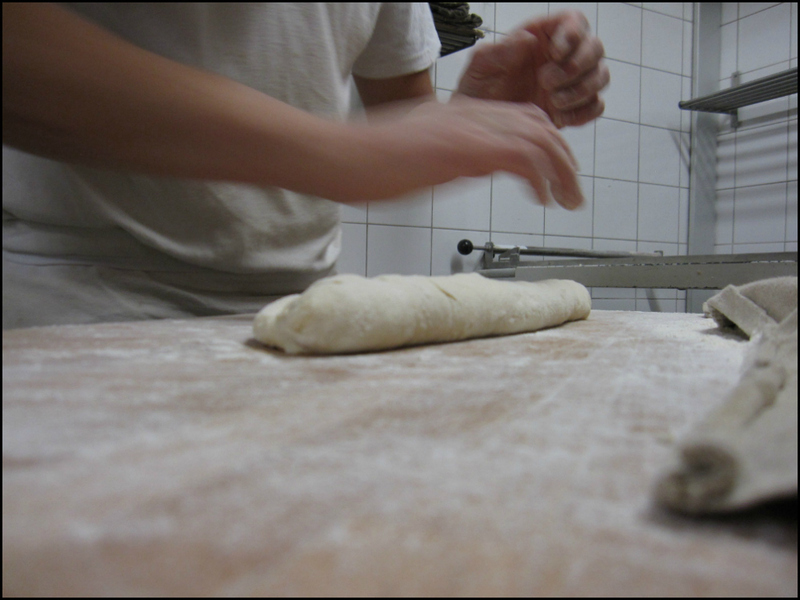 At times it was difficult to keep up with his lightning fast kneading, folding, flipping, flattening, pressing, and patting, along with the dramatic signature slashing, just before baking. 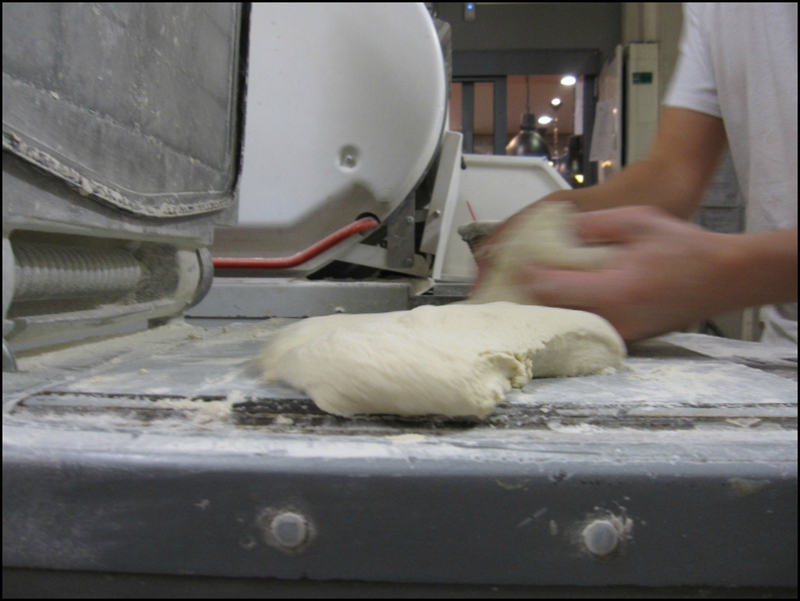 “Let the dough rise. Then work the fingers!” he said. Awe for one! I was in heaven. I was exhausted. At the end of my shift, I was also head-to-toe covered in flour, but I couldn’t have been sappier. See, I got to take home a few of my very own baguette creations, and as I skipped along the cobblestones, I gently ripped off a piece at the very top and popped it in my mouth. Needless to say, tears were shed. I couldn’t agree more. After all, it was the yeast I could do! Carpe diem! I can smell the bread and I am so envious of you sitting there wolfing it down while I am here in NYC with snow falling on the first day of Spring! Romaine and Natalie probably enjoyed many a loaf in their day. Le Grenier à Pain at 38 rue des Abbesses. Thank you. Your baguette piece brings back fond memories of Paris. Merci! The research was my pleasure, of course. Do you have a favorite Paris bakery or pastry shop? We rent apartments when in Paris, and we’ll check out neighborhood bakeries and pastry shops. On our last visit, we stayed in the Marais, and we kept going back to Aux Delices de Manon, at metro Saint Paul. Very good, if you’re close by. If you’re ever near San Francisco, try Berkeley’s Acme Bakery, started by a former bread maker for Chez Panisse. I love their walnut levain bread. There sure is something magical about the baguette. Oui! I planning a return to Le Grenier à Pain. I’d like to learn all about the magical CROISSANT. I’ll pack camera, along with my new vintage baker’s apron, scored at the flea market. It’s a beauty. Fantastic Theodora. I especially like the pastry kitchen shots and of course your dialog. Ah, thank you! The baker was very patient with my constant snapping. He was very sweet. 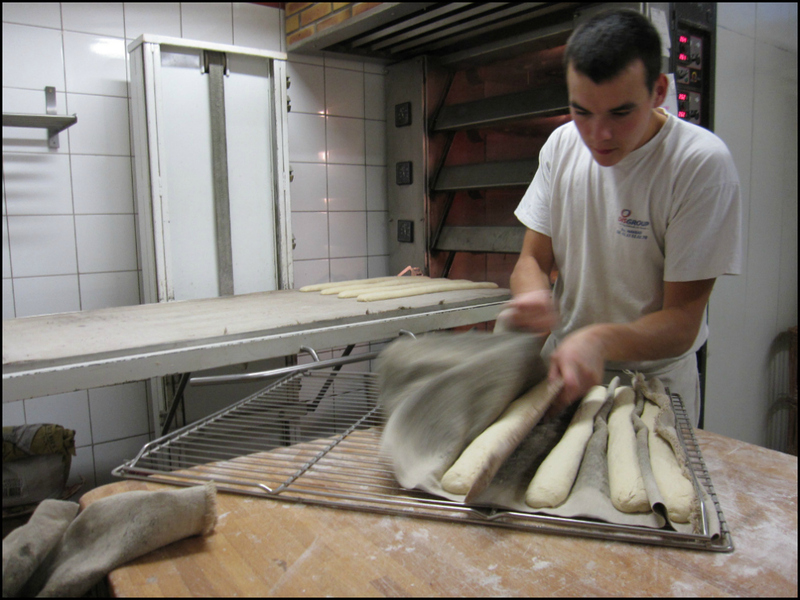 During the week, Le Grenier creates 500 baguettes each day. The weekend loaf count is between 800 to 1200 loaves. Impressive! I would LOVE to go behind the scenes like that. What fun! I sure do love baguette… put anything on a baguette and it takes the sandwich to a whole new scrumptious level! I agree! Do you have a favorite baguette sandwich? The perfect meal. Portable and affordable! Theadora, the Baguette baking procedure has been so visually written that I felt the taste of this delicious product. You got very hungry when you did not eat enough in Paris because all the bakery shops had such good things in the windows and people ate outside at tables on the sidewalk so that you saw and smelled the food. When you were skipping meals at a time when you had given up journalism and were writing nothing that anyone in America would buy, explaining at home that you were lunching out with someone, the best place to do it was the Luxembourg gardens where you saw and smelled nothing to eat all the way from the Place de l’Observatoire to the rue de Vaugirard. There you could into the Luxembourg museum and all the paintings were heightened and clearer and more beautiful if you were belly-empty, hollow-hungry. It was one of my favorite Hemingway ‘s story. By the time of my young age we can learn and travel to Paris and around the World in general only in books and movies. It was the only window to the World. I do not know why but the last sentence in this fragment is most powerful for myself. I hope in couple months I will experience that feeling. In 60th and 70th I watched a lot of French movies and all my impressions about Paris built on that ground. It seems to me nowadays Paris is different. Anyway it worth to visit it. I couldn’t agree more. You’ll find your Paris. With your eye, I have no doubt! Thank you, Theadora. I hope so. 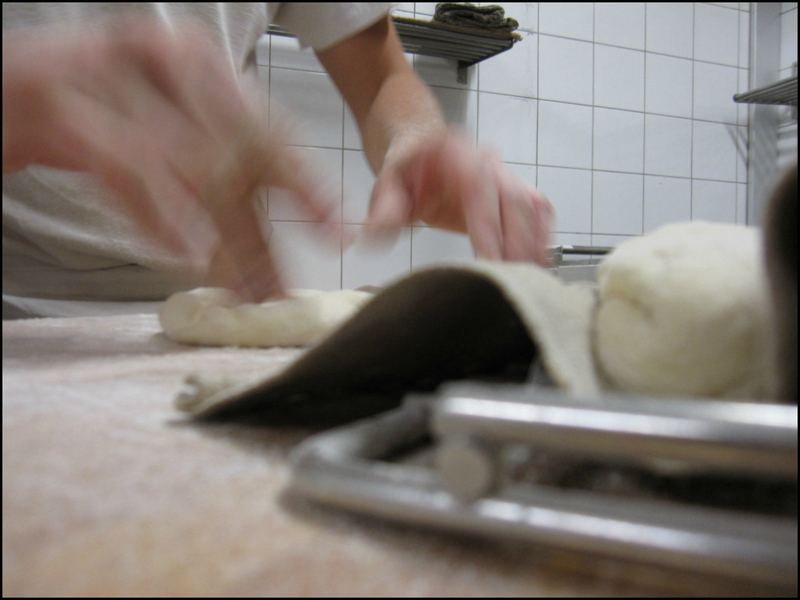 This is my kind of post Theadora – I love baking homemade crusty Italian bread and baguettes. 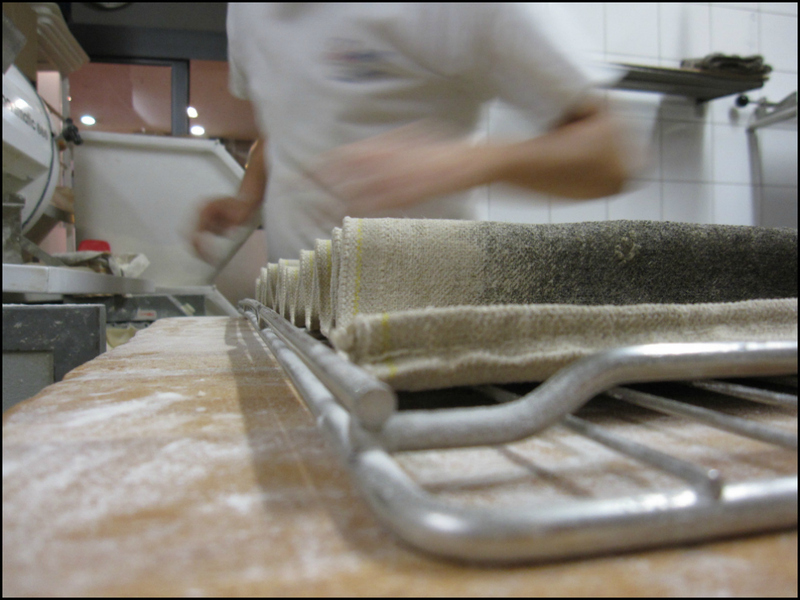 This was a fabulous post, showing the wonderful process that makes picture perfect bread every time. Time honored tradition comes alive in your blog – can’t help but be jealous of not having a helping of your fresh baguette!! Have a beautiful weekend! Sounds like a very special time. Have a wonderful week Theadora! Looks great. I became obsessed with éclairs at bakeries around Paris on my last visit (luckily I was doing a lot of walking)! The éclairs! I’m with you. They’re like little sculptures. Where did you go? Do have a favorite place? Or places?! Oh, how wonderful to be taken back to Paris in the springtime. Thank you, dear friend…. Thank you, Clanmother! Great to hear from you. Springtime + Paris + Baked Goods = Bliss. Do you have a favorite Paris bakery or pastry shop in Paris? Or the world? Any tips? I recall a wonderful afternoon at Angelina’s! Having a joyful week in Vancouver. The cherry blossoms have come and the earth is waking up! Thank you, again. Love following your blog. Angelina’s! One of my favorite places in the world. They just celebrated their 110th anniversary. I’m a big fan of their hot chocolate! Oh, my. Our New England bread juxtaposed with this — it is to weep. At least I have the pleasure of your rhapsody, dear Theadora. And Julia’s memorable quote, what an image! Fantastic! New England Bread? Homemade? Oh, la la. As always, thanks for your enthusiasm. It’s contagious. You made me smile! Now I want a piece, a freshly baked one with “honey-comb” interiors. Well, you’d love rue des Abbesses. 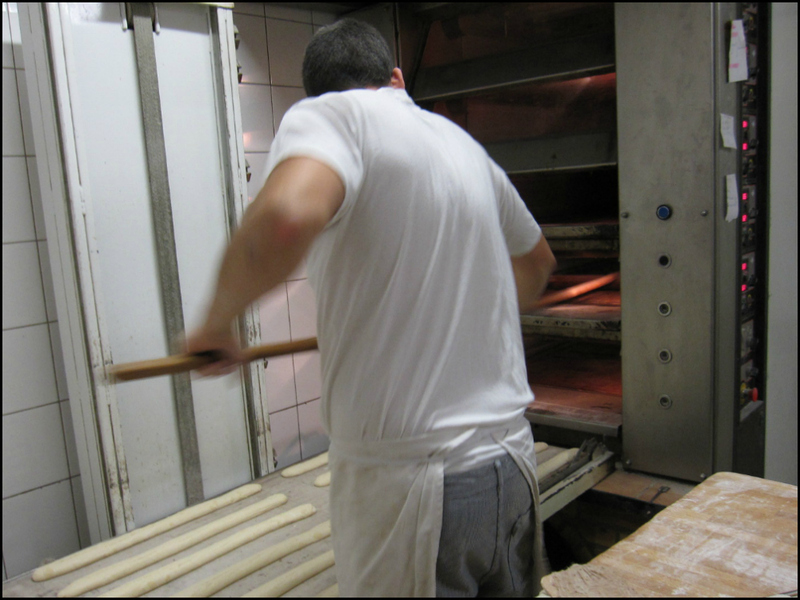 During certain hours of the day, the rue smells of freshly baked bread. Heaven! What a beautiful passage! I agree with you. The process is magical and spiritual. And YES. Tears were shed. Say, didn’t your family own a New York delicatessen? I think you’ve mentioned the special house bread. Was it crumb buns? Still almighty hot to the touch bread. The aroma. Ah, they should bottle it. I’d wear it! Ha! Thanks for the giggle! Both you and Julia have a way with words. Just say thanks to Spanx and pass the bread! Theadora, this post is so up my bread alley! 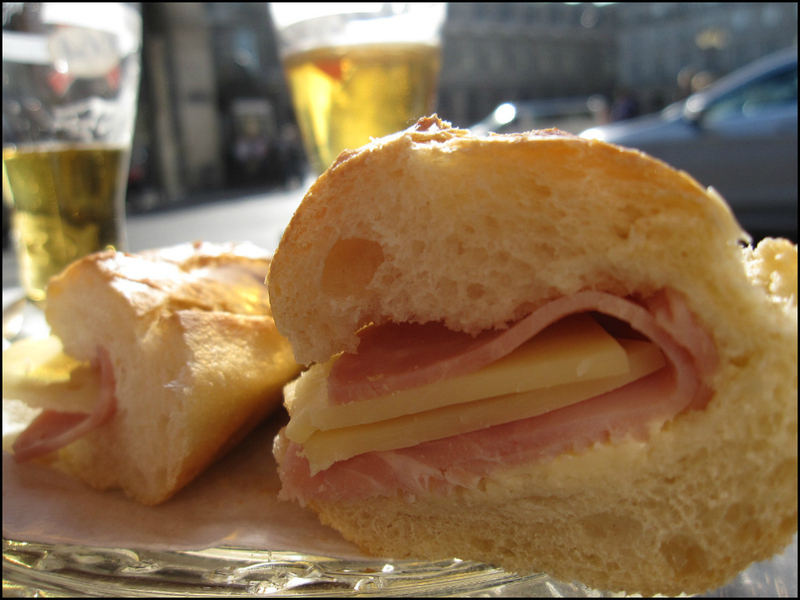 Baguette and jambon are two of the most important French words to know! I think I’d best have lunch now. Ooo, lah, lah! SO nice to hear from you Theadora! Raclette is one of our favorite meals, especially when it doesn’t take half the morning to find the ingredients. Just perfect for time with others, too. What an adventure! I wondered how it was made. It smells divine. I shall certainly have my bags packed! It was a fabulous adventure. I plan to return and get a crash course on the art creating the pain au chocolat and the croissant. It’s about the folding. And yes, keep your bags packed. Next stops are Rome and New York City. And I loved your recent nod to springtime. Beautiful! Dear Philippa, Your words always make my week! Thanks for sharing your positive energy. It was one of my favorite days in Paris. Sleight of hand! The baker’s speed was incredible. His slash marks were works of art. Ah, the patterns he was able to create. Beautiful and scrumptious. A coconut bun? Oh, my. And now I’ve got a hankering for a sandwich on a freshly baked Kaiser roll. Sacrilege! There is always time. But since I have nowhere to go, I’m wearing mine now, even as I type – so there is nothing to worry about. And even if I do decide to absorb a few of those gorgeous sandwiches (oh for goodness’ sake, it’s a foregone conclusion), again there is nothing to worry about – just loosen up some laces. And OH. MY. GIDDY-NESS. You look absolutely fabulous in your ballgown. Custom-made, I am certain. It fits you like a glove. By the way, I’m now a fan of your potent prose. I love the way you mesh history and art and wit, too. Thank you for stopping by my Springtime shindig. Have a Dear, Dear and wonderful weekend! 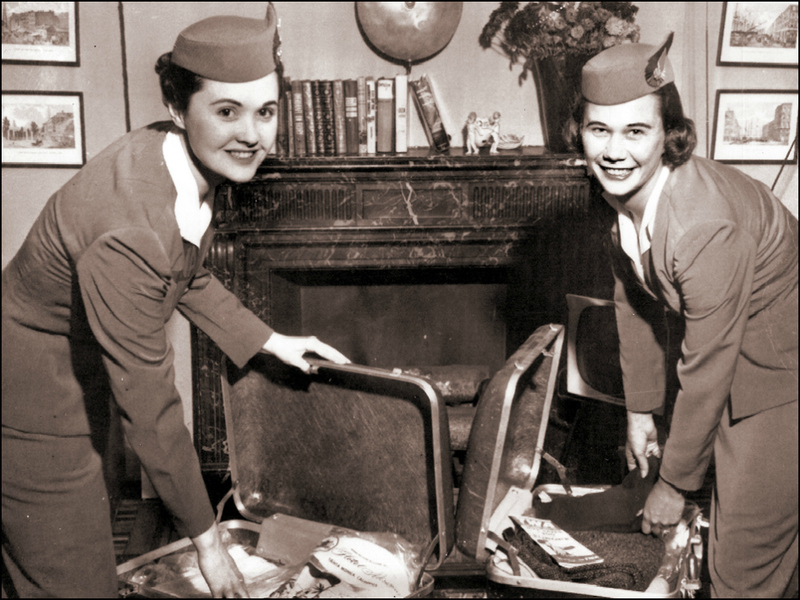 My bags are (half) packed, my beret is perched and my Euros are folded! I am on my way to Paris…a whole week nibbling baguettes, walking by the Seine, Velasquez at the Grand Palais, Sting & Paul Simon at the Zenith, shopping, flaneuring….I’m almost there! And I will be hot footing to this bakery for some carbs. Hurrah! It was a spring night. They sat by the window in the tiny bistro. Then left arm in arm anxious to catch the last silvery light – not wanting this day to end. The red soles of her slippers crushed the scattered baguette crumbs into the cobblestones. The Tin Man sniffed the air. “I have just caught a whiff of T’s perfume.” he exclaimed. “And the aroma of freshly baked baguettes! After her before she eats them all.” Decorum tossed to the winds they chased the bread crumb trail through the l8th and on. A door opened. Red hair and pigtails disappeared inside. They were too late. Yes, the bread thief had struck again! Theadora has beaten us to the last crumb as we dallied in the bistro!. I say we follow her inside ……Virginia, you know she must have another baguette and we have this pate I have snatched from the bistro……..delights, we shall find her……..we must find her! Looks and sounds wonderful, T! Great process shots. You can’t beat a genuine Parisian baguette IMHO. Yummy. I love French bread. And cheese. Yes! I agree. Bread AND cheese. A perfect marriage. Say, I remember your gorgeous photographs of the caves at Société des Caves de Roquefort in Roquefort-sur-Soulzon. Thanks. Think I’ll have to buy some roquefort on the way home now!